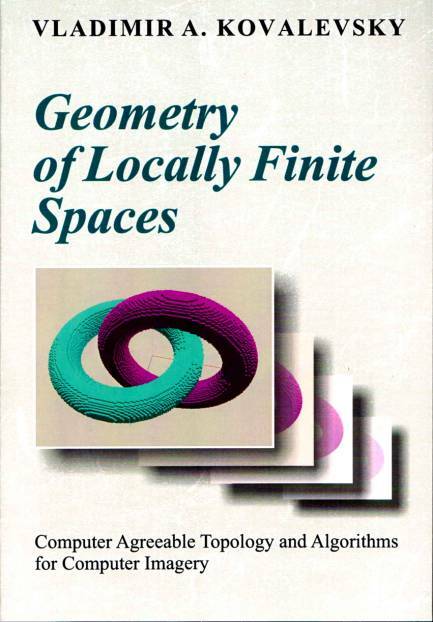 The book presents a self-contained theory of locally finite spaces including a set of new axioms, numerous definitions and theorems concerning the properties of that spaces. It also presents a way of defining digital geometry in locally finite spaces independently of Euclidean geometry. A large portion of the book is devoted to applications to computer imagery. Locally finite spaces give the possibility to overcome the existing discrepancy between theory and applications: The traditional way of research consists in making theory in Euclidean space with real coordinates while applications deal only with finite discrete sets and rational numbers. The reason is that even the smallest part of the Euclidean space cannon be explicitly represented in a computer and computations with irrational numbers are impossible since there exists no arithmetic of irrational numbers. Locally finite spaces are on the one hand theoretically consistent and conform with classical topology and on the other hand explicitly representable in a computer. Coordinates are rational or integer numbers. New data structures and numerous geometric and topological algorithms are presented. Most algorithms are accompanied by a pseudo-code based on the C++ programming language. “It is a real pleasure to read the book. I will recommend it to several people and libraries, because it continues to tell to young researchers that topology of cell complexes is not only the best way for the theory, especially for multicolor images, but also the only practical topology for programming large scale software.”. "It is certainly an impressive work. Much of what it covers cannot be found in any other book that I know of. The book will be an important reference for me and, I believe, for anyone else who has a serious interest in digital geometry. I expect to make much use of it in the future. T. Yung Kong, Professor of Computer Science, City University of New York." “The author has developed a new theory and proved numerous theorems concerning the properties of locally finite spaces. The book, being the first one it its own way, is addressed to specialists in digital topology and digital geometry. It is important for them”. Vladimir A. Kovalevsky received his diploma in physics from the Kharkov University (Ukraine) in 1950, the first doctoral degree in technical sciences from the Central Institute of Metrology (Leningrad) in 1957, and the second doctoral degree in computer science from the Institute of Cybernetics of the Academy of Sciences of the Ukraine (Kiev) in 1968. From 1961 to 1983 he served as Head of Department of Pattern Recognition at that Institute. He has been living in Germany since 1983. From 1983 to 1989 he was researcher at the Central Institute of Cybernetics of the Academy of Sciences of the GDR, Berlin. From 1989 to 2004 he was professor of computer science at the University of Applied Sciences Berlin with an interruption for three years (1998-2001). In that time he was scientific collaborator at the University of Rostock. He worked as visiting researcher at the University of Pennsylvania (1990), at the Manukau Institute of Technology, New Zeeland (2005) and as lecturer at the Chonbuk National University, South Korea (2009). He has been plenary speaker at conferences in Europe, America and New Zeeland. His research interests include digital geometry, digital topology, computer vision, image processing and pattern recognition. He has published four monographs and more than 180 journal and conference papers in image analysis, digital geometry and digital topology. Soft cover: € 27.50; (sold out).